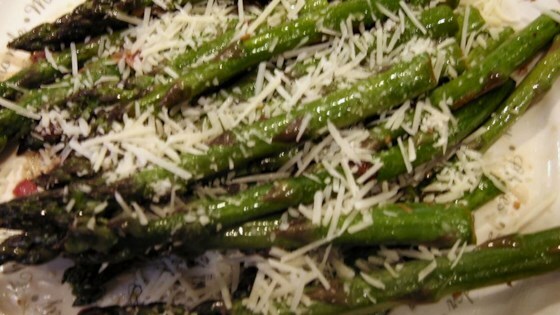 "Asparagus cooked right in the frying pan, drizzled with an onion-wine glaze and parmesan cheese." Heat the olive oil in a skillet over medium-high heat. Mix in onion and garlic, and season with salt, pepper, and lemon pepper. Cook and stir until tender. Place asparagus in the skillet, and cook 8 minutes, turning occasionally to coat with seasonings. Sprinkle wine into the skillet, and scrape up any browned bits. Transfer asparagus to a shallow dish. Drizzle with remaining mixture in skillet, and dust evenly with Parmesan cheese and crushed whole wheat crackers. i also omitted the crackers and it was excellent. i enjoy a "softer" stalk so i left on a little longer. great combination of carmelized onions and asparagus. this is a must try! Very good! I've made it exactly like it said and I've also skipped the crackers and wine and it's still tasty. This was the easiset way I've ever tried for asparagus. The asparagus came out tender and the addition of the red onion was just perfect. Quick and tasty. I didn't have any wine on hand so I used chicken broth instead. Good way to prepare asparagus. I didn't have lemon pepper so I used fresh lemon juice. I too omitted the whole wheat crackers.